Isn’t it wonderful to enter a new year, full of opportunities, and start with a clean slate? Feeling hopeful and having twelve months in front of you – which feels like more than enough time – you start making New Year’s Resolutions. You know they haven’t worked before but this time you decide to add structure so that you’ll follow-through. On the day you make new resolutions, your good intentions are your top priority. But when your life gets busy again and more demands are placed on you, you re-prioritize and put your resolutions on the back burner. You added to your to-do list without first removing items to make room. Your ever-expanding to-do list makes you feel overwhelmed, and the first thing to neglect is what’s new and perhaps intimidating. You haven’t transformed old habits so you keep doing what you’ve been doing for years and procrastinate on your new activities. You rationalize why they can wait. You have a full year ahead of you so you think there will be time later. Months pass and you haven’t made much progress so you start doubting your ability to succeed. Your thoughts are driven by fear and self-judgement. You no longer have access to the energy and enthusiasm you felt at the beginning of the year. You think you know exactly what to do, but you feel stuck and don’t take action. Instead of realizing that you would benefit greatly from working with an Executive Coach, your pride stops you from getting the support that would make you far more successful. And maybe you’re right, maybe you could do this alone somehow, but you’re still not doing it... Your life doesn’t change because you don’t change. Does that sound familiar? 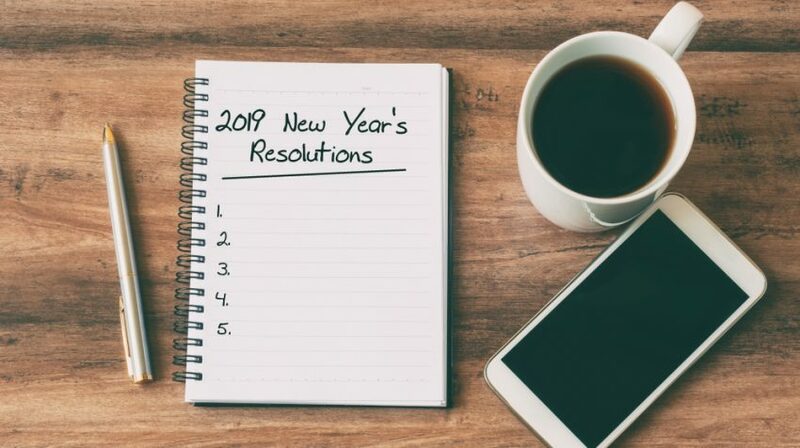 You may not relate to all 5 reasons why last year’s resolutions didn’t work for you, but if at least one rang true to you, keep reading. Start by journaling about what you learned in 2018, what challenges kept you stuck, what excuses you made, and what you want to do differently in 2019. This will sting a little but you need to start the year with a reality check rather than blissful denial. Make sure the past won’t repeat itself. Write down your top goals for this year, as well as your values. They will become your guidance system for decision making. Before engaging in activities, ask yourself (1) whether they will bring you closer to your goals, and (2) if they add meaning to your life. If the answer is no to both questions, say no to the activity. Stay focused on what is important to you. Reduce distractions and unnecessary obligations. In addition to outlining action steps, timelines, and accountability metrics, also write down what you need to change within yourself. Personal growth is what will allow you to accomplish what you never accomplished before. So ask yourself; what stopped you until now? Lack of self-confidence, self-worth, courage, or resilience? What will you do to eliminate fears, self-sabotage, and disempowering habits? To avoid falling back into old patterns, you need to develop daily success habits. For example, you may take five minutes each morning to focus on your vision of success, think about what you want and why you want it, and imagine how you will feel when your vision becomes reality. You can use affirmations or mantras to use throughout the day to keep thinking positive thoughts and advance toward your goals. To maintain a high energy level, you will also need to develop better habits in regards to nutrition, sleep, relaxation, and exercise. Surround yourself with like-minded people who have the same high standards as you do. Stay away from anyone who would put doubt in your mind, encourage you to be complacent, or do anything that isn’t in your best interest. Create a circle of friends who share your ambition and commitment to living an empowered life. I also encourage you to feed your mind new ideas and strategies for success by reading, listening to podcasts, and watching videos from leaders and experts. While strategic planning and time management are vital to success, they are of little value if you don’t develop a strong mindset first. Mindset isn’t like a college degree; you can’t earn it once and have it forever. It is something you cultivate every day for the rest of your life. Consistency and accountability are essential. So tell me, what will you do to make 2019 your best year yet? If you are ready to make a commitment to yourself to achieve a level of happiness and success you’ve never experienced before, I invite you to book a complimentary consultation with me. Click here to schedule it now. We will talk about your goals and dreams and how, together, we can make them happen in 2019. Older PostCould You Be Sabotaging Your Job Search Unknowingly?